Harry Kane was the hero of the night as Tottenham Hotspur came from behind to win the North-London derby against Arsenal. Mauricio Pochettino is a happy man after winning the coveted North-London derby against Arsenal and getting a one point edge over their opponents. Pochettino spoke about how special the victory was and praised Tottenham Hotspurai??i? ?s performance. Pochettino said: ai?? ?Our performance was great because in front of us was a tough team like Arsenal. Itai??i? ?s always a special game. We showed a special energy and itai??i? ?s important to keep this feeling.ai??? The Gunners started the game on the right note as Mesut Ai? 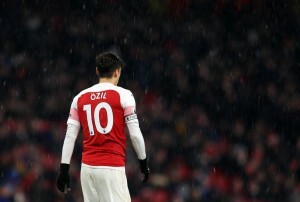 ?zil broke the deadlock as he struck a left-volley in the 11th minute to give Arsenal the lead. However, it was Tottenham who clearly dominated the game, especially in the first half as they fired 11 shots as compared to Arsenalai??i? ?s 2. Tottenham were denied by Arsenal goalkeeper Ospina on three occasions in the first half as he kept out Harry Kane, Danny Rose and Ryan Mason. Tottenham went into half-time a goal behind, but clearly having played a better game that Arsenal. Mauricio Pochettino revealed that he told his players ai?? ?continue doing what you are doingai??i?? at half-time. ai?? ?We said ai?? ?keep going in the same wayai??i?? because we didnai??i? ?t deserve to be 1-0 down,ai??? he said. ai?? ?It was a brilliant game and we fully deserved the victory.ai??? In the second half, Harry Kane emerged as the hero as Tottenham grabbed the equalizer in 55 minutes. Harry Kane converted a rebound off Ospinaai??i? ?s save from close range to make it 1-1. With just five minutes remaining on the clock and the scores level, it was Harry Kane who scored again, rising high to net Bentalebai??i? ?s cross from the left into the back of the net. Pochettino was full of praise and congratulated his team for their performance. He also expressed his happiness with the atmosphere at the White Hart Lane and described how he celebrated the winner. ai?? ?I jumped, I shouted, it was a special moment, a brilliant moment,ai??? said Mauricio Pochettino when asked how he celebrated. ai?? ?It was a fantastic performance. Iai??i? ?m very pleased for the players and congratulate them for a fantastic game. Iai??i? ?m very happy for our supporters. It was a great atmosphere at White Hart Lane.ai??? Pochettino insists that Tottenham need to keep their run going as tough fixtures will keep coming for Spurs. He said: ai?? ?We have to keep going, look forward and move onto the next game now.ai??? Tottenham Hotspur travel to Anfield to face Liverpool in their next encounter in the Premier League on Tuesday.